It’s that time when suddenly everyone’s blogging/tweeting/facebooking their highlights of the past year. PDtP is of course very happy to jump on this irritating bandwagon, given that we’ve been annoying you throughout the year anyway. We kicked off the year with PDtP 5: Back with a Vengeance. It was a bit of a nerve-wracking session in some ways as I had no idea if there would be any ongoing interest in the project after the initial buzz had died down. Happily, you proved my fears to be unfounded as we had a great show of numbers, so much so that we were able to include our very first double choir motet, Gallus’ Duo Seraphim, as well as Lobo’s extraordinary Ave Regina coelorum, his tribute to Guerrero’s equally wondrous Ave Virgo sanctissima, which we had previously sung in a 2014 session. 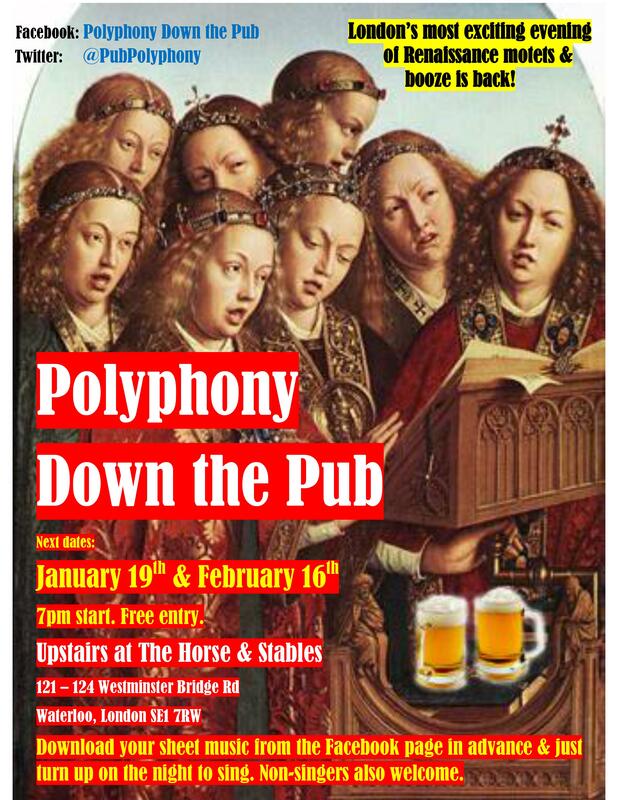 More lovely art from #PDtP artist @Chavender: MT "@urbansketchers @Londonist @se1 #sketchjanuary #drawthepublic pic.twitter.com/RCpOxvHIbU"
By the way, the poster for the January & February sessions introduced our now legendary logo of the van Eycks’ angels having a cheeky couple of pints while accompanying the glorious scene of the Lam Gods. 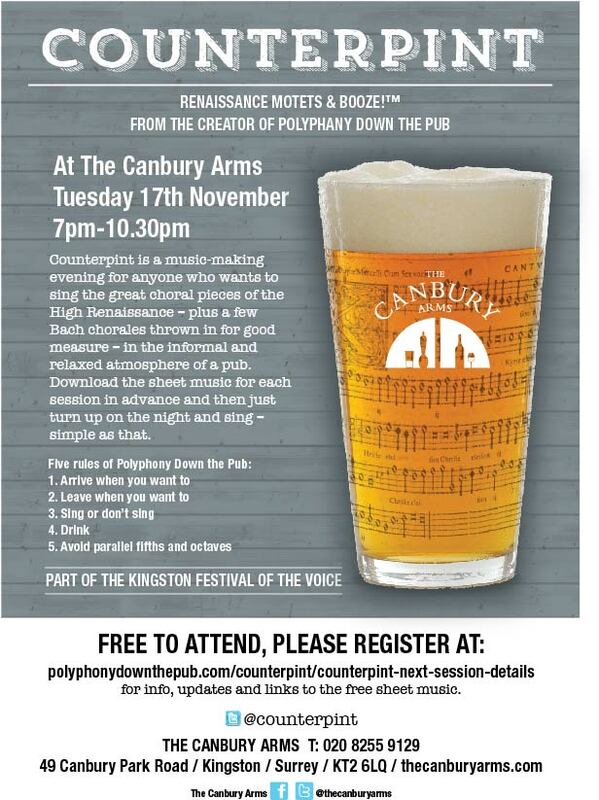 Our second session of the year was PDtP 6: Because You Can’t Keep a Good Singing & Drinking Event Down (catchy, eh?). We pulled off the tricky task of getting a bunch of half-cut blokes to sing the plainchant of Taverner’s Dum transisset Sabbatum I in perfect unison, and we dived into the 7 part lusciousness of Vinders’ O Mors inevitablis. All of the above high-fallutin’ness was nicely counterbalanced by the absurd (and very un-PC) Contrapunto bestiale a la mente by Banchieri. PDtP 7: This Time It’s on a Wednesday brought a slight change to our tried and tested format (can you guess what it was?). As such, we welcomed many new faces who hadn’t previously been able to attend a Monday session owing to other singing commitments; this in turn planted a seed that would eventually flower in November. 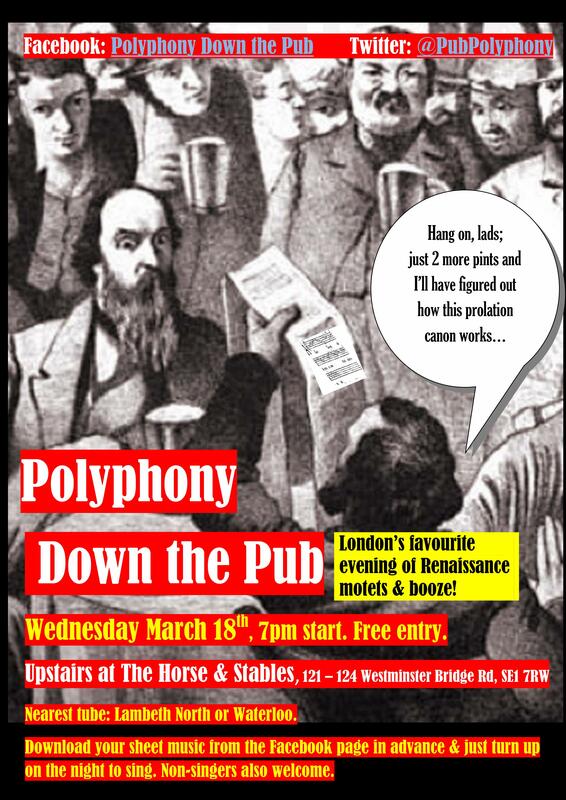 Having such a nice time @PubPolyphony – gorgeous madrigal by Magdalena Casulana inspired by @BBCRadio3 #womensday. We sound really good! Musical highlights were Crecquillon’s Vidit Jacob Scalam and 2 madrigals by Maddalena Casulana, whose inclusion had been inspired by the recent discussions surrounding female composers around International Women’s Day; we hope to have more of her chromatic marvels in future sessions. 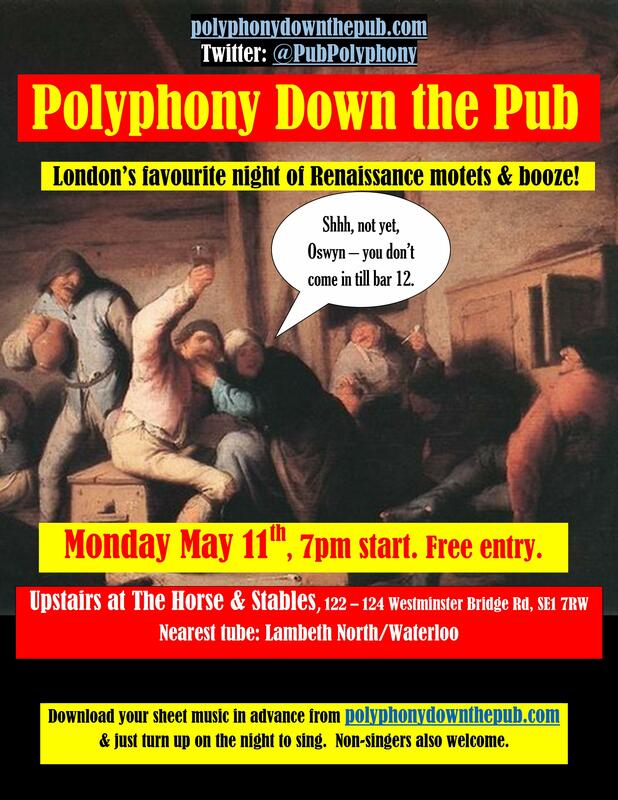 March also introduced the Polyphony Down the Pub website, which was nice. Oh, and the poster once again showed what could be achieved with Microsoft Word and very little graphic design ability. 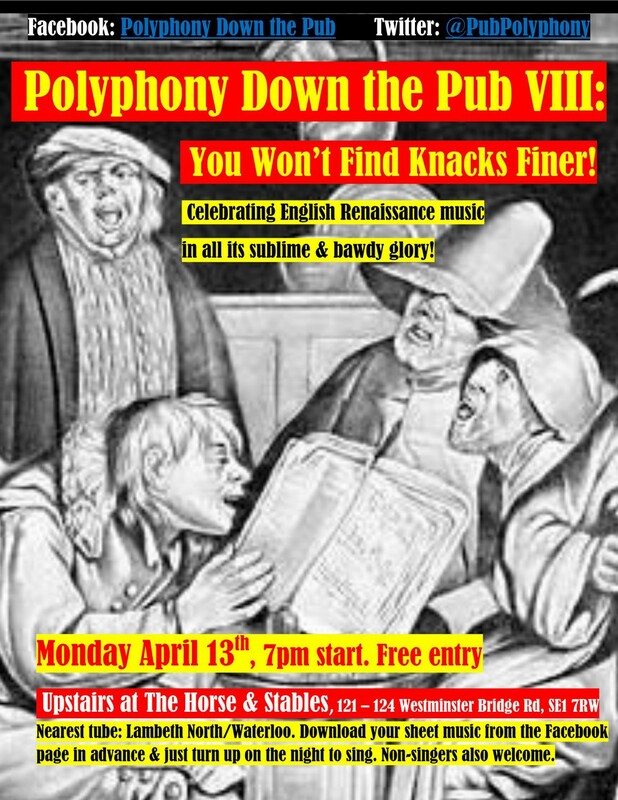 The cheekily named PDtP 8: You Won’t Find Knacks Finer brought us the first of our themed nights, being a celebration of the English Renaissance. As well as the famous Dowland song alluded to in the title, we sang his lovely Say Love if Ever Thou Didst Find, Morley’s It Was a Lover & His Lass plus what was possibly the very first setting of Full Fathom Five for Shakespeare’s own production of The Tempest by his contemporary Robert Johnson. PDtP 9: We’ll Stop Counting When We Get to Triple Figures (we probably won’t, though) was made up of some of the most interesting bits and bobs that we had sung in the previous 8 sessions. Highlights were the Haßler Dixit Maria (a perennial favourite: #dothehassler) and the Victoria Ave Maria a 4. PDtP 10’s in the Mood for Love was a celebration of all things amorous, from the lofty longings of madrigals and chansons such as Pipelare’s hypnotic Vray dieu d’amours down to the filthy baseness of Lassus’ Matona mia cara. Somewhere in between these, we enjoyed a selection of sacred motets based on the beguiling verses of the Song of Songs, including L’Héritier‘s Nigra sum. 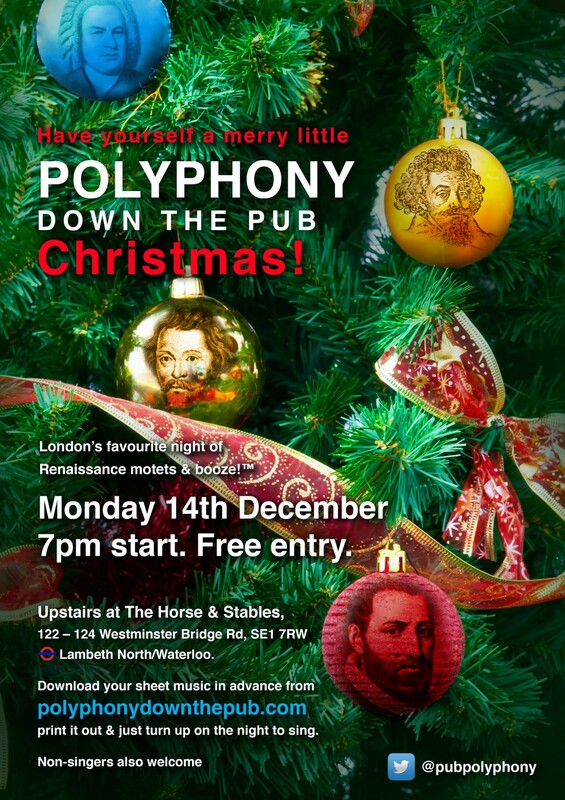 The poster was put together by a graphic designer friend using an actual graphic design programme; no one complained. 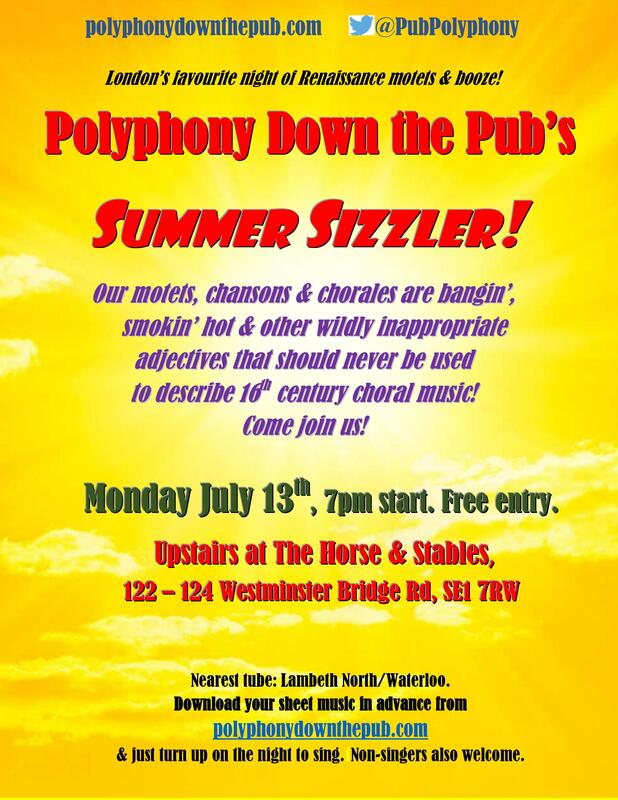 PDtP 11: Summer Sizzler saw the return of the inept Word-based poster (hurrah!). A favourite on the night was Mouton’s Ave Maria, with its canon in inversion hidden in the texture. This was our last session before a well-earned summer break. 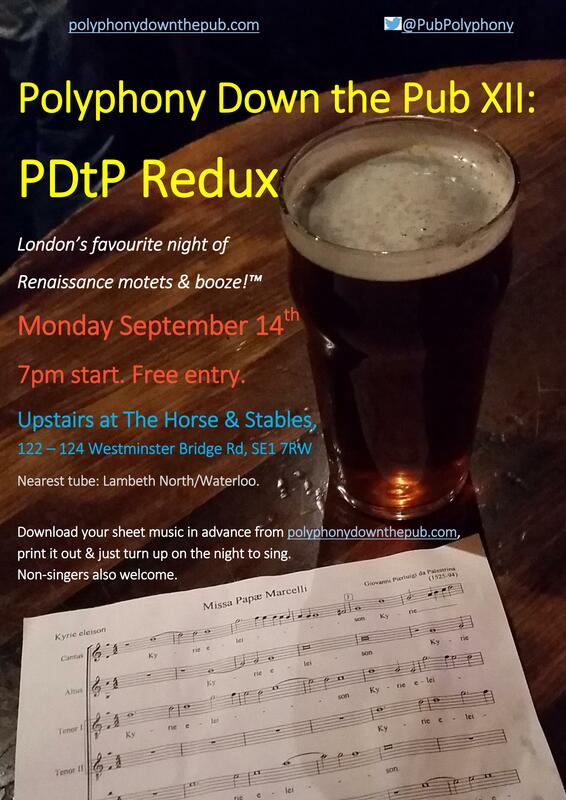 As its name suggested, PDtP 12: PDtP Redux stormed back onto the early music in a pub scene in triumph. The poster embraced photo-realism for the first time, while the session itself introduced Fevin’s Sancta Trinitas, an absolute belter, and O Sacrum Convivium, an early motet by Uncle Gabrieli (Andrea). We enjoyed a very special session with PDtP’s First Birthday Bash. Not only was it a review of the best bits of the previous 12 months, we also enjoyed the largest attendance that we had seen since our first session. Highlights were Bennet’s Weep O Mine Eyes & another bash-through of Gallus’ epic Duo Seraphim. Perhaps not reaching quite the same heights of musical excellence was this questionable attempt at Happy Birthday a la Bach, though kudos to the singers who gamely held their noses and sang it through! 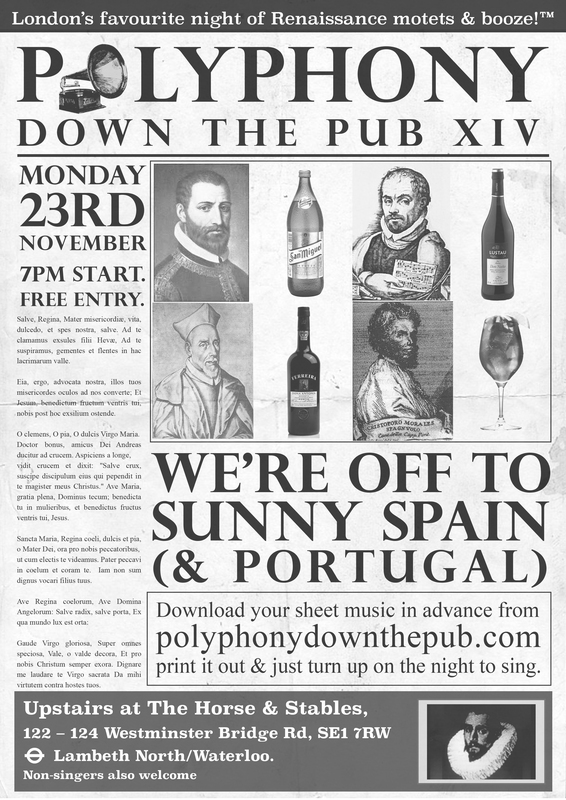 As well as the inaugural Counterpint (which was a great success not least because of our excellent hosts The Canbury Arms in Kingston), we enjoyed the fruits of El Siglo de Oro in PDtP 14: We’re Off to Sunny Spain! (And Portugal! And Mexico!). Miraculously, we did more than a bit of justice to Victoria’s Alma Redemptoris a 8, a masterpiece that embraces both marvellous grandeur and gorgeous delicacy. The Stabat Mater by Spanish-Mexican master Padilla also proved to be a winner. We finished off the year somewhat spectacularly. 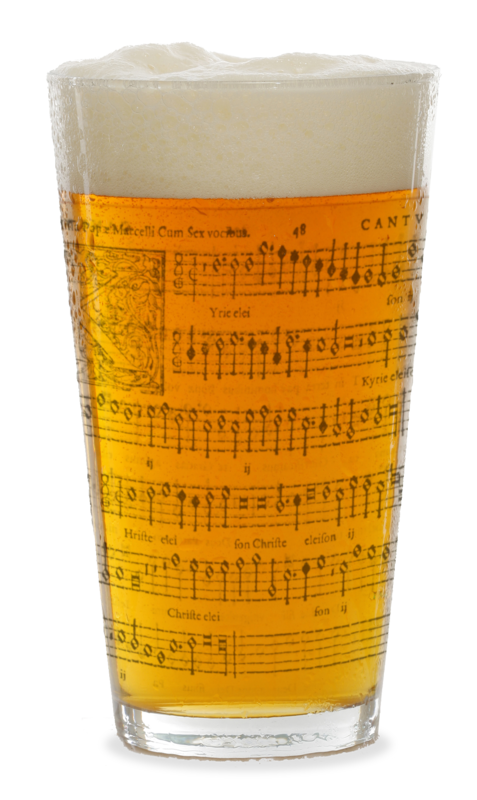 First up, we had The PDtP Christmas Special: Have Yourself a Merry Little Polyphony Down the Pub Christmas (again, just trips off the tongue), another 70-hander in which we enjoyed masterworks by Praetorius (Michael & Hieronymus) and an almost correct rendition of Bach’s Vom Himmel Hoch. Secondly, we nabbed a singing spot in Trafalgar Square, during which we entertained a crowd of tourists and locals with our Christmas motets and traditional carols, raising a wodge of cash for charity. Finally, thanks to the programme’s presenter coming along way back in March, we were profiled on the Christmas edition of BBC Radio 3’s The Choir, which was of course a great privilege. 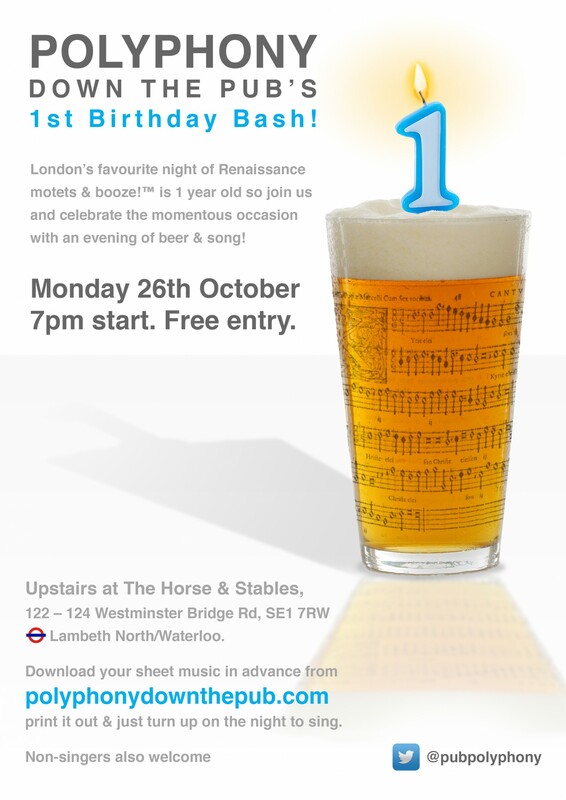 So there we have it – a year’s worth of singing, drinking, merry-making and conviviality. I hope you’ve enjoyed it as much as I have and I hope even more that we’ll be seeing you at PDtP and Counterpint in 2016. In the meantime, thanks again to you all and Happy New Year! I very much enjoyed my first visit to PDtP in December, it was brilliant, and I am looking forward to the one on January 18th. Have you by any chance fixed the date for the next one which I imagine is in February? I have had an invite but would rather do PDtP if I have to choose! Previous Previous post: Not one but two opportunities for January boozin’-‘n’-singin’!